Beat Dry Winter Skin (Before It Starts) | Valet. 'Tis the season for chapped knuckles, rough elbows, itchy legs and otherwise cracked, miserable skin—that is, if left unprotected. After all, between the elements outside, dry heated air inside (and excessive holiday drinking), the winter season can be pretty harsh on skin. Herewith, four expert tips on keeping your skin healthy and itch-free until spring. We know a long, hot shower feels good, especially on cold mornings, but Andrew Goetz—one half of the apothecary brand Malin + Goetz—advises against it. "That's the number one mistake guys make in the winter," he says. "I know they feel nice, but they'll dehydrate your skin very quickly." Aim for shorter, lukewarm showers until March, at least. And while you're in there, use a wash cloth to gently scrub your skin all over. This helps with itchiness and stimulates circulation and boosts your body's natural oils. Beware of harsh soaps with a lot of artificial scents or antibacterial agents. They tend to remove the protective oils our skin produces. Dr. Robert Dellavalle, a dermatology professor at the University of Colorado, suggests you be strategic about soaping up. Hit the spots that tend to smell (armpits, feet and groin) and stay away from spots that tend to dry out (lower legs and abdomen). Apply a rich moisturizer as soon as you get out of that short shower, to seal in moisture. 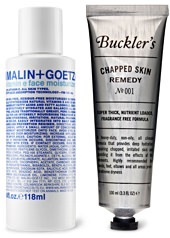 Malin + Goetz's vitamin-rich lotion does the job without being overly heavy and its calming properties will reduce redness and soothe post-shave skin. For the really rough spots (think hands, feet and elbows), opt for something even more heavy-duty, such as Buckler's Chapped Skin Remedy. Counter the dry indoor heat of your home or office with a humidifier. "This can make a huge difference just by increasing the amount of water molecules in the air around you," says David Bank, M.D. of The Center for Dermatology. Why shave everyday when you can just take a little off the top? Prep your skin for the cruel conditions outside.